I am pleased to share news of this current group exhibition that I am participating in with ceramic artist, Delores Coan, and invited Hotchkiss School alumni. 'Friends of Fire' is a tribute to my former art teacher and creative mentor, Delores – who is completing her final year of teaching at Hotchkiss after thirty five years of sharing her talents and wisdom. "Teaching ceramic art has been a humbling and exhilarating part of my life," she says. "I've made lifelong links with many students through sharing the creative process. The joy I've derived from passing on this ageless art has been one of my life's greatest gifts." Coan adds, "We can all make a big difference by continuing to support art programs so that students may learn and explore varied disciplines to fulfill their artistic destiny." – D.C. I am currently in the process of archiving and editing close to a year's worth of Walking Libraries documentation (or rather three-quarter of a year's solo walks) in California, New York State's Hudson Valley, NYC, and both rural and urban Bulgaria. One of the most striking discoveries for me is the language created by site-specific features or marks in regional landscapes. A sidewalk crack with a dessicated leaf in Sofia creates a call and response with a coastal sand fissure near Pescadero, California. A vocabulary of sorts seems to be emerging via personal notations and geographical features documented while on the trail. With a goal of slowing down but also looking more deeply into the fissures of daily life and the fragility (read: resiliency) of our environs, a more current understanding of self in relation to the environment seems imaginable. I still hope to complete certain itineraries out west this winter, closing the loop on a full year of examination and movement-based activity. From there a new chapter might present itself, or the 'library' might be made accessible as an open archive or mapping tool for others. 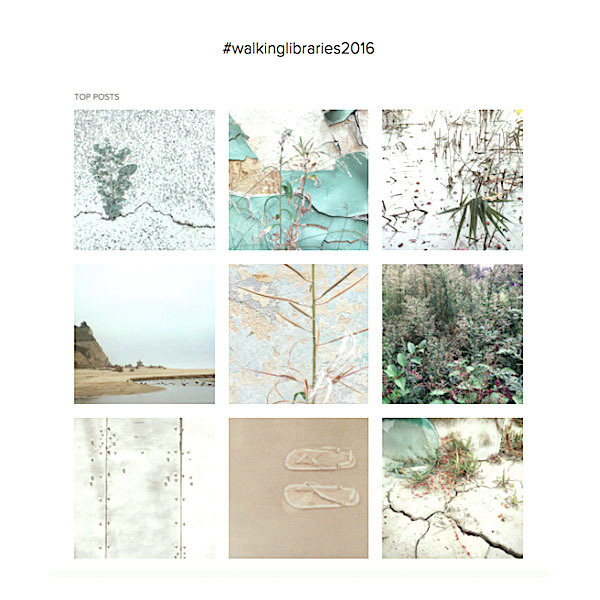 Follow #walkinglibraries2016 on Instagram, for more images in the weeks/months to come.